Contrary to popular belief, concrete is far from just a boring, drab gray surface. Nowadays, thanks to innovative techniques in the concrete industry, Concrete Contractors Fayetteville is able to provide an exciting option to homeowners: concrete staining! With over 2 decades of experience, our masons and workers know all the proper techniques to ensure that your concrete stains look awesome and makes you the talk of the town. Stainging can create an attractive beaming color surface because of how it interacts with concrete, as opposed to using paint which will not have the same effect. Depending on how it is used, it can create the illusion that you can marble floors instead of concrete, or imitate other natural stones. Staining is very popular for walkways, patios, and floors because it creates a fascinating and interesting effect one would not expect from concrete. It is much more affordable than other stones, and can be very flexible for whatever area it is in. 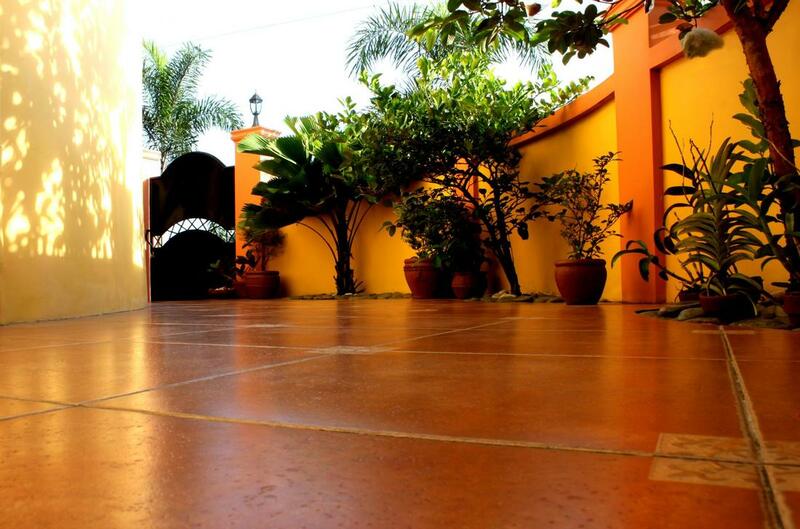 When it comes to concrete staining, there are two primary types: acid-based chemical stains and water-based acrylics. Using hydrochloric acid, water, and acid-soluble metallic salts, we can create a beautiful stain by permeating the concrete's surface. By utilizing the acid's natural carving abilities, the metallic salts can settle into the organic designs in the concrete, showing off a very physically appealing look that can stand the test of time. Traditionally, acid-based chemical stains are more earthen tones. If a more striking, eye-catching decore is what you desire, then water-based stains are right up your alley. While they are similar to acid stains in the way the interact with the concrete, they are different because they can be applied to new or pre-installed concrete floors. They can entirely change the tone of a room, going from boring drab grey to bright, attractive pigments. Either type of stain can definitely increase the value and visual comfort of your home. Due to the amount of work, time, and money that goes into staining concrete, it is best to call a professional as opposed to attempting to do it yourself. There are specific techniques and materials to used to stain concrete, and using the incorrect ones can cause damage and cost hundreds of dollars. Because of our over two decades of experience, you can trust us to do the job quickly, properly, and efficiently. We have dealt with multiple techniques and types of staining, so we will ensure that your floors turn out just as you want them to. ​While there are plenty of concrete companies in the Fayetteville, AR area, here at Concrete Contractors Fayetteville our reputation proceeds us. We have been trusted for over twenty years to properly handle and provide concrete services. Our masons are both skilled and speedy, keeping your project on time yet still creating impeccable and meticulous works of art for your home. Balancing both affordability and quality, you will get the most bang for your buck when coming to our company for any work you may need. We have hundreds of satisfied customers who will attest to the integrity of our work.